It seems that every shot has already been taken so how do you avoid the clichés and make unique images that are yours alone? Here’s 11 more examples of street photography clichés that prove a good photographer can rise above the cliché to create truly interesting images. Hit the jump to see them all! You can’t help but be influenced by the images you see. But clichés happen when a good idea or unique way of seeing the world is repeated enough to become ubiquitous. So how can you be influenced by the things you admire without simply copying them? The trick is to make every shot your own. Here’s 11 more examples of street photography clichés where the photographer rose above the obvious to create a truly memorable image. Georges Seurat’s masterpiece of Pointillism depicts people relaxing in a suburban park on an island in the Seine River called La Grande Jatte and thanks to photographers like Alex Webb, layered scenes like this became the Holy Grail of street photography. Noppadol Maitreechit’s beautiful shot uses layers to create a complex and interesting world that extends far into the frame. 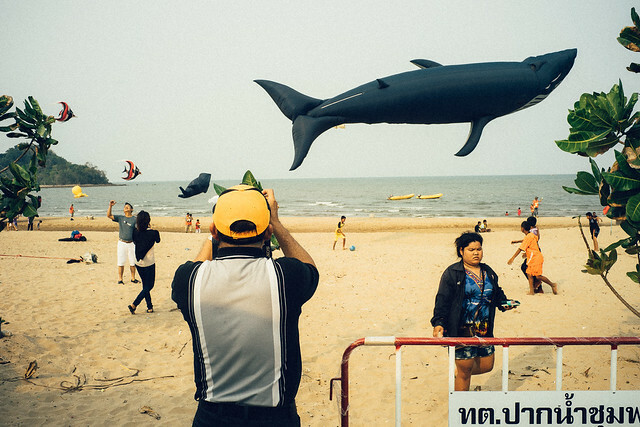 The whimsical whale and tropical fish kites in the sky perfectly compliment the many humans frolicking on the beach to create a lyrical image that speaks as much about the place as the impression it left on the photographer. Way more than an exercise in composition Noppadol’s shot transcends the cliché with fulidity and grace. Perspective gags are often impossible to resist. Go ahead and line up those incongruous elements to create a visual one-liner and you’ve got yourself another street photography cliché. Kuba Jasionek rises above the obvious joke and creates a charming image where the main subject’s welcoming smile embraces you in a way that her lopsided arms cannot. My eyes can feast on all the little details of the candy shop on the left hand side of the frame but the tiny arm keeps drawing me back. I love this shot! When trade relations between Cuba and the U.S. were re-established it created a kind of street photography gold rush. The great untouched land was shiney and new for photographers who came back with countless pictures of children playing soccer in abandoned swimming pools and 1950’s cars cruising down the brightly painted city streets. 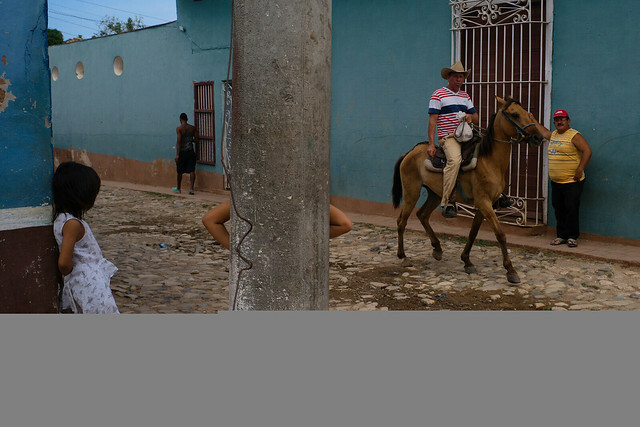 Cuba is the new frontier of street photography clichés. Siri Thompson captured an interesting moment that ebraces the citizens on the street as an impartial observer. The mysterious girl leaning on the post that bisects the frame creates a lovely triangle with the girl to her left and the man in the background. While the two figures on the right hand side are aware they are being photographed but seem (like the horse) to be taking it in stride. It’s a complex composition of a simple moment and it works on so many levels. Siri is a friend of mine and you should definitely check out her Flickr stream for some really excellent work! The single leg sticking up in the air. Detached from the rest of the person it takes on an abstract quality that begs to be photographed. And it’s a street photography cliché. 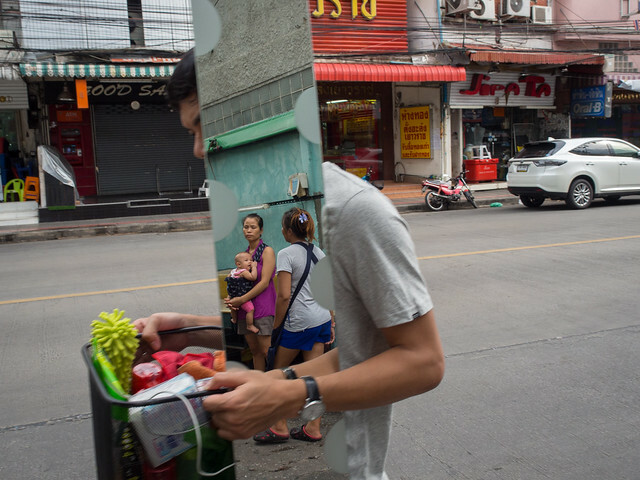 Setsiri Silapasuwanchai uses two different legs to create this compelling image. The angle of the legs compliment the arc of the water fountain to create a playful sense of place in an image that asks more questions than it answers. It’s crafty and complete! You’re walking along, minding your own business when you glance to the side and see it. The guy to your right is standing in the perfect position so it looks like he has no head. It’s begging to be photogpraphed and it’s another street photography cliché. 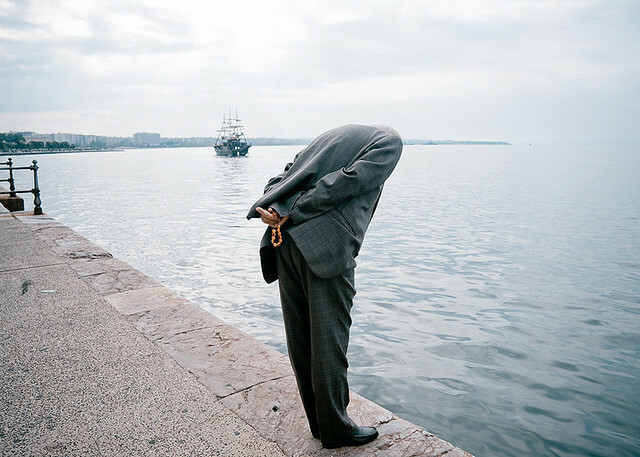 Kasapidis Giorgos captures this humorous moment by juxtaposing the pirate ship in the background with the headless man’s hands held behind his back. You can almost imagine that he’s walking the plank! The horizon line cuts across the poor guy’s shoulders and appears to be the culprit in his decapitation. The image creates an engaging atmosphere and is successful on many levels. Well done! Smoking (especially E-Cigarettes) can create great billowing clouds that totally consume the smoker’s head. It’s visually interesting and incredibly tempting but it’s still a street photography cliché. 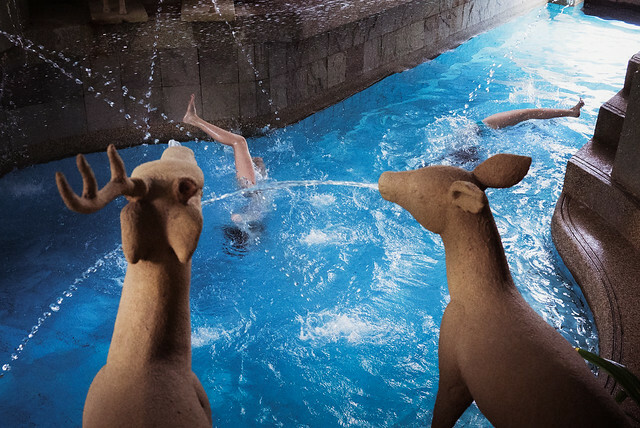 Sel One uses the three hands to create a sense of narrative as the blunt is handed off. The thick cloud of smoke completely obscures the smoker’s face and creates an other-worldly quality. The shot has an honesty that feels like documentary but its abstract enough to be compelling beyond a simple description of what that scene looked like. Nicely done. Nuns live under vows of poverty, chastity, and obedience. So any time they’re juxtaposed against the modern world they can create a humorous counterpoint that’s difficult to resist. Nuns walking past a strip joint, nuns frowning at public kissing, nuns playing basketball… They’re all street photography clichés. Jeffrey De Keyser takes this idea to another level when the simple gesture of a nun resting her eyes on the subway could also be read as disgust at the girl’s short shorts. This is a funny little vignette that steps above the obvious and lets our own mind fill in the gaps. A simple scene that any of us may have passed by without a second thought. Well done! We’ve all seen them. The man in a striped suit crossing the street at a cross walk that’s painted with stripes. Or the woman wearing a flowered dress sitting in front of a rose bush. They all seem clever in the moment but they’re all street photography clichés. Shin Noguchi catpured this amazing moment at night on the streets of Shinjuku, Tokyo. And while the pattern on that yellow dress is unmistakeably similar to the tiles on the road, the woman seems almost hyper-realistic against the drab city street and the image becomes more of a portrait of the moment than a record of the visual pun. This one sticks with you. The single finger pointing has become so ubiquitous in the street photography world that I considered carrying one around so I could insert it into any old boring scene and make it instantly better. Like a selfie stick. But another person pointing stick. The point is that pointing is a street photography cliché. Edas Wong takes this idea to another level by incorporating the pointing finger in a way that is both abstract and integral to the image. The finger draws your eye to the skater where you realize that the giant hand could be the cause for the skater’s distress. It’s a funny image that engages on a number of different levels. Nicely seen, indeed! A mirror makes a fantastic frame within the frame that reflects the world in unexpected ways. And anyone carrying a mirror is a street photography cliché. But Issaret Chalermsopone takes this concept a step further with this in-motion capture. The mirror itself bisects the frame and reflects another perfectly framed vignette that shows a woman carrying her baby. The entire image feels serendipitous which adds to the magic of the shot. It’s not just a dude carrying a mirror. It’s a new world created at the intersection of the photographer, the man with the mirror and the woman reflected. Really nicely done. Maybe it’s the crazed, distant eyes and the sneering mouth. Or the sheer absurdity of seeing a human being with a horse’s head walking down the street. But any time I see someone wearing a horse mask I reach for my camera. And another street photography cliché is born. 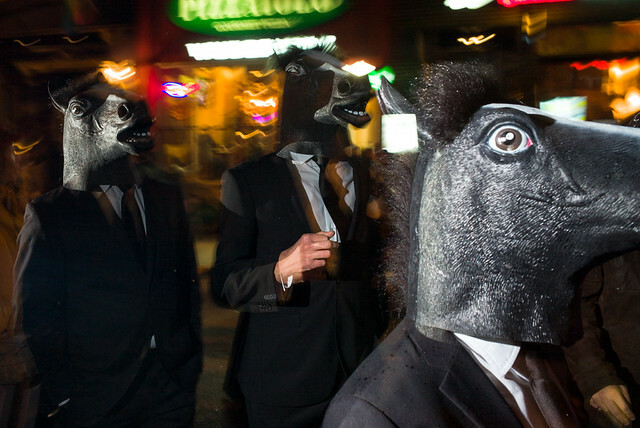 I shot these three “Horse Men In Black” last year on Halloween and it was the group herd that initially caught my attention. I used off camera flash to emphasize those crazy eyes and dragged the shutter a bit to give the impression that they were galloping down the street. Cutting off the horse in the foreground’s muzzle emphasizes the crazed eye and creates the impression that he’s looking right at you. Not entirely sure if it rises above the cliché but I kinda like the shot! While researching this article I came across the concept of Vemödalen: The Fear That Everything Has Already Been Done. And I wondered if it was even possible to create something unique. Has every photograph already been taken? In literary terms, a cliché is defined as a phrase or opinion that is overused and betrays a lack of original thought. Clichés undermine the very nature of creativity and act as a kind of photographic tracing paper. Instead of simply creating something that simply looks like something else the trick is to put your own stamp on the image. Each of the photographers in this post saw the world in their own unique way and rose above the cliché. Proving that it doesn’t matter if what you’re shooting has already been shot by someone else. It’s not about seeing new things, it’s about seeing things in a new way. See also: 16 Street Photography Cliches That Are Impossible To Resist (But You Should Still Try). What’s your take on street photography clichés? Has everything already been done? How do you prevent clichés in your own work? Post your ideas in the comments below and keep the conversation going!